Hi [INSERT YOUR FRIEND'S NAME HERE], Please check this out https://www.proactivehealthcare.co.uk/quicksilver-scientific-metal-detox-imd-intestinal-cleanse-3-month-supply?referrer=0 and get £4 off your first order (minimum order £30 excl. shipping). Thanks! Quicksilver Scientific has developed a sophisticated detoxification system based on enhancing the natural removal of metals through the intestines using a proprietary compound, IMD (Intestinal Metals Detox). WHAT IS IMD INTESTINAL METAL DETOX EXACTLY? The Intestinal Metals Detox (IMD) is a proprietary product that consists of highly purified silica carrier with covalently attached metal-binding groups. The product is insoluble and functions to bind heavy metals in the gut so that they can besafely eliminated with the bowels; this prevents both absorption of the heavy metals and the generation of free-radicals catalyzed by the metals. In fact, the product can also directly neutralized free-radicals in the gut and thus may play a role in damping gastro intestinal inflammation. Both the silica base and the binding agent are GRAS (generally recognized as safe) for use in food, but since the binding agent is firmly attached to the insoluble silica, it is not absorbed and thus not bio available. IMD Intestinal Cleanse contains no known allergens and no allergic reactions have been reported to date. Binds mercury and other heavy metals in the intestines and escorts these harmful contaminants out of the body. Intercepts methylmercury trapped in enterohepatic circulation. Leads to lowering of blood mercury levels, allowing organ and tissue bound mercury safely to drain into the blood at a natural rate Improves the bodys natural detoxification ability by quenching free radicals and stopping metal-catalyzed free-radical reactions, which can otherwise lead to inflammation and cause down-regulation of detox transporters (Phase III transportersOATs, cMOAT, MRPs, etc)Fortifies the link between the intestines and the immune system. 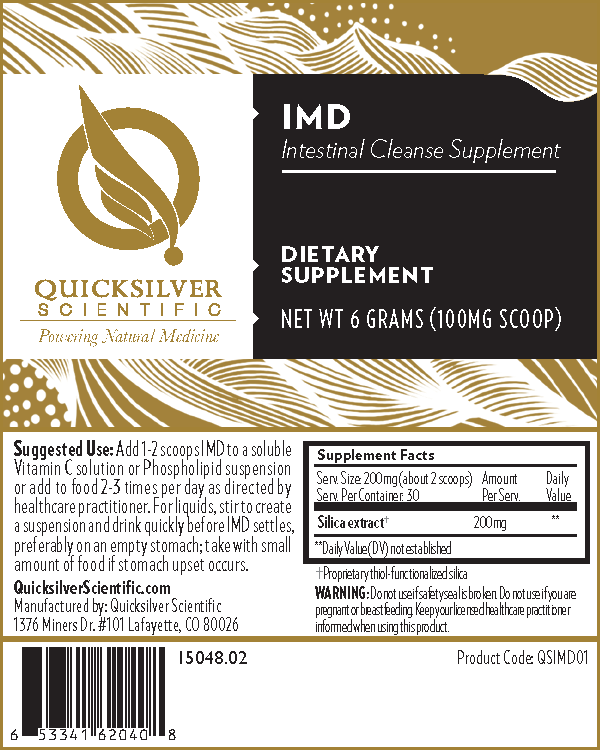 Quicksilver Scientific Metal Detox IMD Intestinal Cleanse is an highly effective medicine. Caution: not to be used by infants, pregnant or nursing women. Administration: Mix one scoop of IMD in water or juice, and drink quickly to avoid the settling of particles. Dosage: Regimen: For a long-term cleans take 5 days on/ 2 days off in a rotation. For acute problems, take continuously until symptoms subside. Discover our full range of safe Mercury Detox products. Please do not order this item if shipping to Norway as customs will send it back. If you place an order to Norway it will be refunded! 1 scoop of intestinal metal detox mixed in water or juice daily on an empty stomach, take 5 days on and 2 days off in a rotation. Quicksilver Scientific IMD Intestinal Cleanse can be taken first thing in the morning or right before bed. Take away from minerals, Glutathione, and Clear Way Cofactors. For advanced use take 1 scoop, 2-3 times daily. For sensitive patients, start with half a scoop per day, and work up to the full dosage. Children 12 and under: 1/2 scoops, or as tolerated. Proprietary formula: Base of highly purified silica with covalently bonded elements. Does not contain any known allergens or fillers. Comes with a pre-measured scoop for easy use. Length of Treatment: The general course of use is 4-6 months as a basic cleanse, up to a year for deeper cleansing. Periodic use after the main cleanse (one month two times per year) is helpful for two reasons: 1) To remove new accumulations, and 2) Deeper deposits may not be accessible during the first cleanse and can move out and become more available after the body adjusts to the first cleanse. The speed/intensity of the cleanse can be controlled by the dosage. Most people experience a need for more sleep at night, but if pronounced fatigue is experienced during the day, the dosage can be decreased until comfortable. No major side effects have been reported. Minor side effects include: fatigue and mild headaches. These reactions are common during any type of cleansing. During this cleanse it is important to increase water intake and make sure that you are having at least 1-2 bowel movements a day.